To generate impact and emotional pull, we are told, one is better than one million. Nothing beats the power of an individual story. I was again reminded of that fact through a note forwarded recently from colleagues in Haiti who are overseeing a Partners In Health Canada-funded project on prevention and treatment of gender-based violence. 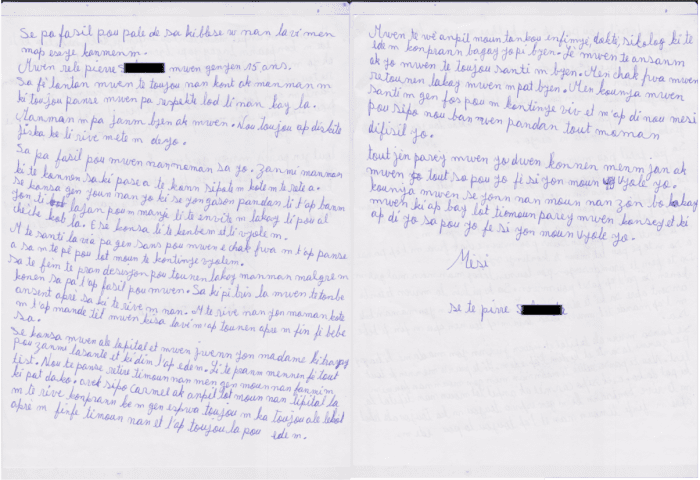 The note was written by a 15-year-old girl (we’ll call her Gisele, not her real name) who was raped and subsequently became pregnant. In the letter, she describes how the support she received from doctors, nurses, psychologists other staff trained through the program helped piece her life back together after her attack. It’s not easy reading and that’s the point. You can find Gisele’s note here. We’ll wait while you check it out. Finished? Great…now take a moment to compare this girl’s story to the two billion people worldwide living on less than two dollars a day and the 1.3 billion who don’t have access to clean water and the hundreds of millions lacking access to essential and basic healthcare, and on and on and now you’re checking your phone…. The frustrating part is that such outrageous and indefensible macro-level statistics are exactly what we’re fighting against. It feels like a defeat to not scream injustice at the scale of it, individual stories and progress to date be damned – because the scale of the inequality we have allowed to persist is the greatest crime. So in 2017, while we will continue to share our many successes as told through the eyes of those we serve, we promise to never stop talking about how much is still to be done. One other thing about storytelling: when it comes to building a global movement needed to tackle the big issues, we also need to tell our own stories. Stories about why we as individuals care about these issues in the first place. Our stories are important because they’re what bring like-minded people together in the face of injustice, and sustain us all in the hard work of doing something about it. We try to encourage students in our university chapters to share their individual stories with each other. We talk about our own stories in the office, although perhaps not often enough. I hope you talk about your story to build connection in your own social justice circles …and in your social circles. If Partners In Health is a vehicle through which you collectively choose to fight injustices large and small in 2017, your impact will be felt by so many Giseles. Too many to tell all their stories, but they’re out there all the same. It’s not very easy to tell you of all the things that have hurt me in life, but in any case I will try to tell you. My name is Gisele and I am fifteen years old. My mom has been upset with me for a long time because she thinks I don’t respect her household wishes. We actually fought until she threw me out of the house. It was not at all easy for me at this time and the friends of my mom who knew what happened supported me where I lived during my time out of the house. One of those people was a boy who gave me money sometimes to cook. One day he invited to his house to get the money and that’s how he raped me. I was feeling very sad and I told myself that my life no longer had meaning. Every time I thought of what happened to me, I became very scared of being raped by other people. I had finally decided to return home with my mom despite the fact that I knew it would be really difficult for me. The worst part of this whole story is that I became pregnant and I really started to wonder what would become of me after I gave birth. But it was then that I met a lady at the hospital that worked for Zanmi Lasante* and who gave me some help. She took me to the lab to do some tests. My pregnancy test was positive and made the decision to have an abortion but my family forbade me from having one. With the support of Marie Carmelle and some of the other hospital staff, I began to realize that there was still hope. And I would be able to continue to go to school after giving birth. I always have always benefitted from her help. I met a lot of health professionals, doctors, nurses, psychologists who helped me to understand what happened to me. I felt much better every time they were with me. Unfortunately, as soon as I got home, I began to feel sad again but this time I was feeling strong enough and had the will to survive so I thank you all for your support when I was going through this very difficult time. All young people like me should know what to do in case they are raped. I am now a young girl in my community who helps other young girls and support in knowing what to do if they are raped too. *Zamni Lasante is Partners In Health's sister organization in Haiti.